By combining the power of four telescopes, an international team of astronomers has captured the most detailed image yet of a distant star—an observation that’s meshing well with pre-existing theories about the physical characteristics of giant stars. This star, first catalogued back in 1756, has the curious name of π1 Gruis, or Pi1 Gruis. The moniker comes from an old-timey naming convention known as a Bayer designation, a system that labels stars with a Greek letter followed by the Latin name of its constellation. The exponent indicates the presence of a binary star system, so yes, this star has a companion named π2 Gruis. π1 Gruis is reaching the end of its long life. Now bloated to about 350 times the size of our Sun, it’s a sneak preview of what our host star will look like 5 billion years from now. Astronomers are studying the system to learn how stars evolve and what they look like before they hit their expiration date. As the new image shows, this particular giant is mostly circular, featuring complex areas of shifting material known as granules, or convection cells. 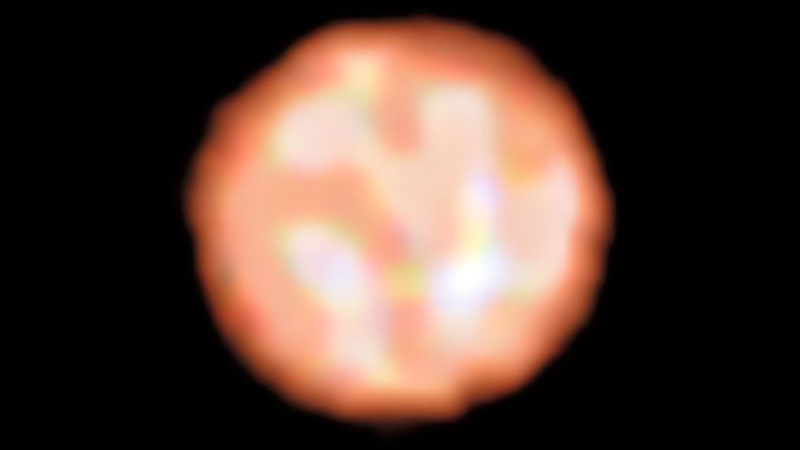 Astronomers have visualized the surface of a distant star before, namely Betelgeuse (another star at the end of its life), but this latest visualization offers more detail. Importantly, it’s the first image of a star where we can actually see active granules on the surface, and it’s the first to confirm theories about the physical characteristics of late-stage, giant stars, according to new research published this week in Nature. Another cool thing about the photo is that we can literally see temperature variations on the star; the white areas represent the hottest areas, while the red splotches are cooler. Indeed, this image was made possible through the use of four different telescopes, all in Chile. Baron’s team used an interferometer to combine the signals from multiple telescopes to produce a resolution equivalent to a much larger telescope. The astronomers also used reconstruction software and algorithms to visualize the star’s surface. Convection—a physical process in which heat is transferred due to the mass movement of molecules—creates pulses, winds, and energy shifts on stars. Our Sun features about 2 million convective cells—some around 2,000 km across—but giant stars should only have a few large convective cells on account of their low surface gravity (these stars may be big, but they have a very low density relative to their size). Granules have been difficult to detect on late-stage supergiants because they tend to be clouded by orbiting dust. π1 Gruis is an exception to that rule. As noted in the new study, this star features massive surface granules, the largest of which occupies upward of 27 percent—more than a quarter—of its surface. It’s an exciting result because it confirms pre-held theories about these types of stars. Looking ahead, the astronomers would like to capture moving images of the granules to see how they shift and evolve on the star’s surface. Correction: An earlier version of the article incorrectly described how interferometry was used in the study.